A constant topic of discussion among football watchers is how much money each club gets, and why. For the last three years HPN has tried to break through the web of footy related financial reports, and break down each club’s financial allotments. The AFL recently released its Annual Report for the year ending in October 2018, and included is a list of how much funding each club received from the AFL. The AFL uses a funding model to promote competitive equity. Every club is put on a relatively even basis, both on-field and off-field, regardless of their revenue-raising abilities. The funding model sees every club funded to pay 100% of the salary cap, and aims to have clubs spend a relatively similar amount off-field on football-related matters. Off-field spending is managed by a football department soft cap, which it is the AFL’s attempt to curb the gap in off-field spending by charging a tax (now 100% of every dollar) on spending over a certain amount. The Australian reported in 2015 (on 2014 data) that the spending gap between the top and bottom end was as wide as $4.4 million, and all indications are that extra funding and the cap have equalised off-field spending considerably. In Footballistics we estimated using annual reports that the spending gap had halved by 2016. Under the soft cap, rich clubs cut spending as they baulked at passing the cap and paying tax, and they became less able to poach high-quality staff from poorer clubs. Spendthrift clubs like Brisbane and the Bulldogs have used new funding to boost their expenditure significantly, resulting in a more level playing field. The justification for this strong redistribution is that it’s not merit which determines how much money clubs make, but structural factors largely beyond club control. Supporter base size determines how much ticket, membership, merchandise and sponsorship money a club can collect, and support base size is very difficult to change except in long term special circumstances, like accessing a big new market, or winning premierships every few years for five decades. Interestingly, all four major American leagues (NBA, NFL, NHL and MLB) directly take and redistribute some club revenue streams, but this doesn’t happen in the AFL. Clubs keep all their own commercial, gate, merchandise, and membership revenues and, aside from a brief experiment, are not taxed on them by the league. After abandoning an experiment with a modest but hated and misdirected revenue tax, all equalisation is now accomplished on the revenue side, with the AFL using its centrally-distributed streams to pursue equity. Clubs receive travel funding, with the most obviously going to WA and Qld teams. Clubs playing at Docklands receive signage income via the AFL rather than directly from sponsors. Clubs receive money from AFL Membership, based on nominated club of support. This nearly all accrues to Victorian clubs since AFL Membership is effectively an MCG season ticket. Clubs in finals get prize money (about $ 1 million for the premier) and finals costs covered. How much does an AFLW team cost? AFLW funding is also included in the “Other Payments” section of the chart above. It’s difficult to pin down the picture for most clubs, but thanks to the Demons we have a good picture of how one AFL women’s program works. According to the Melbourne annual report for 2018, their AFLW team cost $450k in player payments, and $401k in program costs, and they spent $192k on the winter VFLW competition. They received $886k in AFLW revenue, including AFL funding covering most player payments, with the remaining income being AFLW-specific sponsorship and membership. This means that club absorbed the costs of their winter development team, and the AFLW team itself was effectively funded by the AFL’s player payments contribution and the club’s AFLW-specific club revenues. 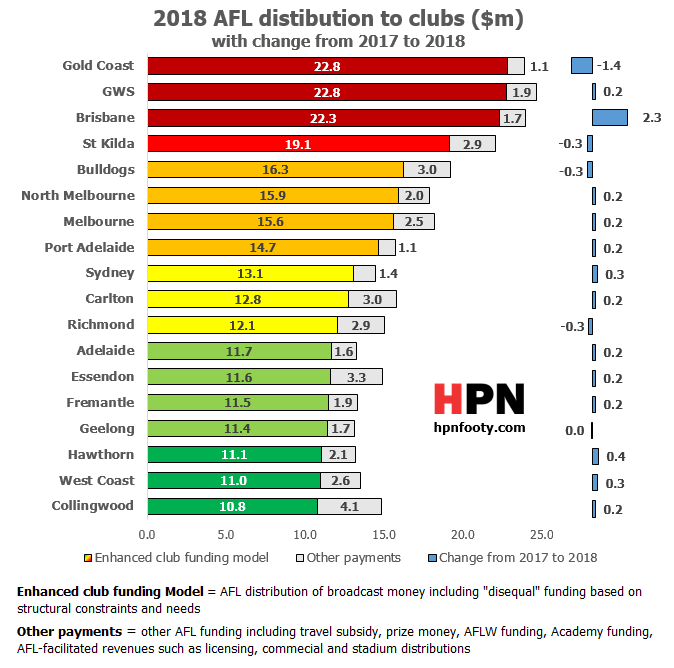 Teams who receive the most structural support unsurprisingly includes the expansion teams GWS and Gold Coast, as well as the four small-market Victorian teams in St Kilda, the Bulldogs, North Melbourne and Melbourne. Despite winning the premiership in 2016, the Bulldogs haven’t really seen a big jump in their “size”, because they’re still bound by the limitations of a modest supporter base. According to club annual report data compiled at FootyIndustry.com, in the 2018 reporting year which began 12 months after the premiership, the Bulldogs’ tickets and memberships were around St Kilda and North’s level. They had roughly the same sponsorship income as GWS. At the bottom of the distribution list are of course the richest and most popular clubs, who receive a minimum level of funding, roughly covering their player wage bill in line with the broadcast revenue sharing deal. This rich list includes West Coast, who have massive multi-million dollar operating surpluses every year even after handing millions to the WAFL. That’s thanks to the league’s highest membership revenues and a lot of corporate hospitality income. Hawthorn also figure highly due to having high membership, decent crowds, and a huge gaming machine portfolio. Collingwood of course have a huge supporter base, but in 2018 reporting they also still had large scale pokies operations (which they sold in December). Other clubs receive different levels of extra funding above the minimum, based on those structural factors such as supporter base, stadium deals, and their off-field business arrangements. Other relative heavyweights include Fremantle and Adelaide, who have similar “captive city market” factors in their favour as West Coast. Fremantle have a minority share of the large and wealthy Perth market, while Adelaide have the bigger slice of Adelaide (Port Adelaide, with only a minority share of the smaller and less economically dynamic Adelaide market, seem to require more support than the other three). Geelong have lower crowds and probably less supporters than the other clubs who receive the same level of support, but they’re a very low cost operation, benefiting from a favourable stadium deal with Geelong City Council which lets them keep a very high proportion of the football revenues at Kardinia Park. Essendon are in this bracket too, and given their supporter base and social club revenue, they’re probably only kept from the upper echelons by a long period of limited success, the many millions squandered over their recent doping scandal, as well as the constraints of playing at Docklands. Why aren’t Richmond treated like the “biggest” club? Richmond had the largest membership and some of the biggest crowds in 2018 after winning a premiership in 2017 . Yet by the AFL’s funding model they are notably still treated as a mid-tier player here, on par with the success-deprived former heavywight in Carlton, and the Swans who live in a non-traditional market. With Richmond’s current large crowds and very high membership count, this seems odd on the face, but there’s a few factors to consider. Firstly, this funding is largely mapped out in advance so clubs can plan around it. It doesn’t fluctuate hugely year-to-year. Richmond’s baseline is a lengthy period of smaller crowds and less success. If they find sustained success and set a new higher baseline, presumably their relative funding levels will reduce accordingly over time. Remember, too, that not all crowds and memberships are equally lucrative, and that commercial capacity plays a role in a club’s financial situation. Richmond’s social club operations are much smaller than Hawthorn or Collingwood’s or Essendon’s, bringing in probably less than $1 million in actual profits after cost, a small fraction of those bigger operations. The MCG allows huge crowds without supply constraints on tickets, and it allows the Tigers the sale of a lot of lower value memberships such as 3-game entries. In contrast, a club like West Coast mostly sells premium 11 game packages due to demand and can jack up ticket prices due to scarcity. And of course at the biggest MCG games, a big chunk the crowds are supporters of the Tigers’ Victorian opposition, whose membership money isn’t going to the Tigers. All this means that the Tigers, even with a post-premiership boom underway in all the 2018 financial data, did not make as much money from membership and gate as the Eagles did in a typical year (before their own flag). Even with premiership bonuses built into many sponsor deals, the Tigers didn’t make as much corporate revenue as Hawthorn or Collingwood or (presumably) Sydney. So far, despite the memberships boost, the main commercial marketing survey of supporter bases, Roy Morgan, doesn’t think they’ve got a bigger supporter base than Essendon or Collingwood. We should., however, note that the survey period there is July to June. That means the Tigers’ inevitable premiership bandwagon of “casual fans who suddenly remembered they like the Tigers”, a phenomenon for every premier, won’t be fully visible until the next release. The two biggest changes apparent on last year’s distributions are for the two Queensland clubs, with Gold Coast’s funding dropping by $1.4 million and Brisbane’s increasing by $2.3 million. Other changes were by between -$0.3 million and +$0.4 million and it’s difficult to identify clear reasons for them. For both Queensland clubs, the shifts are probably down to sponsorship wrangles. Gold Coast lost major sponsor Fiat and were accordingly topped up for 2017 by the AFL, but have now signed on a travel insurance company called Cover-More, and also sold a game to Perth in 2018. The Lions, on the other hand, lost Camperdown Dairy at the beginning of the 2018 reporting period and the increased funding may reflect the gap left during the year. 2019 may not look a whole lot better for the Lions on this front, because Vero departed at the end of 2018 and they are planning to sue the tech startup SOOW for money owed after the company was abruptly terminated as sponsor in March. The new sponsor, a betting company, may or may not entirely fill the gap. While football has long aspired to create financial equality, the level of redistribution achieved today is a fairly new phenomenon. Gate receipts sharing was instituted in the VFL in the the 40s, but by the 2000s this practice didn’t even favour the smaller clubs, and was abolished. The practice of giving extra central funding to small clubs began with a modest additional handout of $1 million to the Bulldogs in 2002 and the Kangaroos in 2003. It evolved steadily from there, but it really took the football department spending soft cap and the most recent broadcast deal to reach the fairly complete equalisation of football club spending capacity which we see today. We’ve quietly entered a new era of equality in the AFL. In football expenditure, at least, the clubs can now be said to all be placed at the same point on the starting line. Next Post:Wait, are the Suns now good?